Make-up artist, Jazmina Daniel was inspired by the most-liked Instagram photo ever, and spent more than four hours painting it onto her own mouth. She created the entire portrait using a tiny brush and it includes the blue background, green veil, and floral wreath around the mother to be. The photo has sparked huge interest, with 60,000 likes and 2,400 comments. Jazmina, from Los Angeles, captioned the photo of her lips saying, "This one is for you! @beyonce Tag the Queen if you think she'd approve ." Beyonce's Instagram photo currently has over 10 million likes. She posted it at the start of February, announcing that she and Jay-Z are expecting twins. 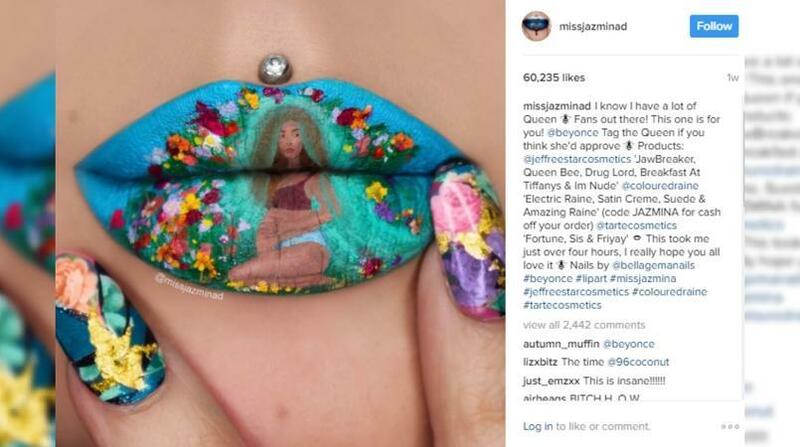 This isn't the first time Jazmina has painted pictures on her lips. Inspired by films and art, she's has posted multiple puckered portraits. These include Cinderella in her ball gown, Edward Scissorhands and Harry Potter. Another Instagram favourite is her Dark Knight-inspired Joker lip art, where Jazmina shows how it's done.